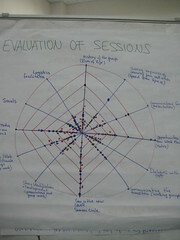 The Spider diagram method is a “quick and dirty” way to get a useful snap shot about how participant's evaluate a workshop or generally the achievement of project objectives. Use it along with interviews and if necessary in addition to a more formal survey. 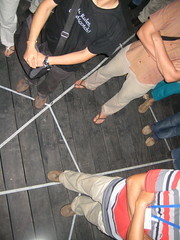 It allows to give participants an immediate visual impression of the group's thinking. For each item to evaluate draw a line from the center to the circle. Write the item on the intersection between the line and the circle. Draw spider lines from the inside to the outside of the circle (see photo). Gather the participants around the flipchart. Ask them to put one dot for each item: If highly ranked the dot should be close top the center; if poorly ranked the dot should be close to the circle. Present and discuss the result with the group. Gather the participants around the floor. Ask the group to stand nearby the center if they want to rank the item as achieved and to stand nearby the circle if they want to rank the item as less or not achieved. Don't try to formalize the spider diagram by attributing numbers afterwards. Use surveys if you need formal evaluation. Take pictures of the flipchart to share afterwards and with wider audiences.